Writers Festivals are popping up all over Australia – some in the most unlikely places. Those in the capital cities are becoming crowded with little hope of getting anywhere near the presenting author, let alone being able to ask a question (an indication of how popular they are becoming). Now in its fourth year, the Whitsunday Writers Festival is unique in that it specifically offers the opportunity of close contact with the authors over drinks and dinner. 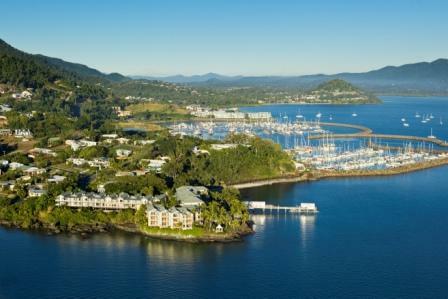 This year the festival will be held 12-14 July at Coral Sea Resort, Airlie Beach, a principal sponsor of the event. The Whitsundays are about as beautiful a setting for a writers festival as you can imagine, and yes, the water is really that colour. This year's speakers include such names as Anita Heiss, a member of the Wiradjuri nation of central New South Wales and author of Am I Black Enough for You, Joyce Morgan and Conrad Walters, authors of Journey on the Silk Road, L.A. Larkin, author of Thirst, who will lead a one day thriller writing workshop on Friday 12th July, and marine biologist Tony Ayling. Previous speakers include David Hill, ex CEO of ABC television and Susan Wyndham Literary Editor of The Sydney Morning Herald who both commented that the festival has a lot to offer everyone, including the guest speakers. As July is peak season for the Whitsundays, this Writers Festival can be combined with a winter holiday. It is a wonderful way to escape the cold weather down South and not as far as Ubud. For further details go to wowfestival.blogspot.com or contact the organizer, Gloria Burley on 0422026793. Flipping through my overloaded bookshelves to decide what to read next is never an easy task. I'm not complaining one bit, but there are so many good books that come through my letterbox (a reviewer perk), that I sometimes have to make a cursory judgement using a combination of name (have I read and liked their work before? ), cover, publisher reputation, and how hard the publicist has worked to get my attention (the good ones contact me personally and tell me exactly why I'll love a book - we all hope for a publicist like that one day...). Well-respected poetry publisher Giramondo never tries to get my attention, but they do send me great, innovative poetry books on a regular basis and even if I've been swayed and distracted by a great publicist, I'll always try to flip through what they send especially if I've been reading a lot of prose (as indeed I have) and need a poetry break (I do). In this case the book I picked up was Lisa Gorton's Hotel Hyperion. I'll be writing a full, detailed review soon, but as has been my tendency lately, I wanted to give you a quick taste of what I've been absorbed with in that fresh flush of discovery, before I synthesise and summarise it. Following is Gorton herself reading (beautifully) three of my favourite (so far) poems from the book - the first three in the section that gives the book its title "The Hotel Hyperion". I think, once you begin to listen, you'll see exactly why I love them. The blend of sci fi, desire, a domestic, female kind of longing, and the crispest imagery make these poems both exquisite and powerful.